Turn entertaining into high art. Created to commemorate Riedel's 250th Birthday, the Riedel Amadeo Lyra Decanter is a masterpiece of mouth-blown glass art. The skillful glass blown art is so intricate that it makes each piece unique from another. No two Lyra Decanters look alike. 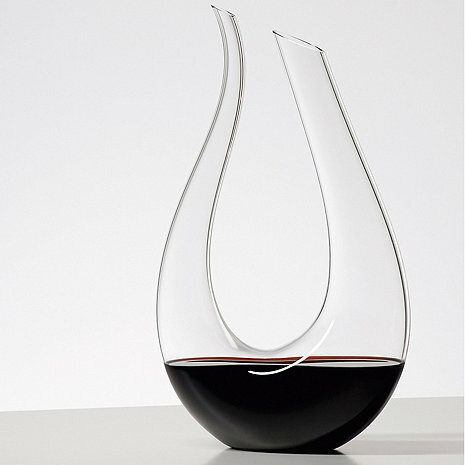 This Riedel Amadeo Wine Decanter boasts a unique & challenging shape and design. Only experienced master glass blowers can produce it. Note: The only products that can be used to clean the Riedel Amadeo Lyra Decanter are the Decanter Cleaning Beads. Can I put a whole bottle of wine in the bottom part ? BEST ANSWER: Yes, a 750ml bottle will fit in the Amadeo Decanter. Does this come with a drying rack? BEST ANSWER: No and because of its odd shape drying is a bit of a problem. You need to be a little creative. It is beautiful and works well though. No this does not come with a drying rack. Can this decanter be engraved/etched/monogrammed? BEST ANSWER: Thank you for your question unfortunately due the shape of the Amadeo Decanter it cannot be monogramed. We do carry many other decanters that can be personalized. Please reach out sales consultants @ 800-356-8466 for more information. No, it can not be engraved, etched or monogrammed. Is this glass or crystal? BEST ANSWER: The Riedel Amadeo Lyra Decanter is mouth-blown glass and each decanter is unique. We have been looking at this decanter for a couple of years and it is everything we imagined. We were very pleased to recieve the drying rack with it; we wish we had one for our other decanter! Beautiful decanter. [...] Save hundreds from buying from a retail store. Absolutely beautiful and surprisingly easy to clean. Smaller than I imagined, and the price performance ratio puts one in the decadent category. Purchased one as gift for a client who is a wine enthusiast and had to get one for myself. All in all I love it, it pours very well and is a stunning piece. This is a beautiful decanter. However, I was disappointed with a flaw in the glass- I will not buy any more glass merchandise on line as one cannot see what one is getting before making the purchase. This is a pricy decanter, and in my opinion, the quality and perfection of the piece should match the dollars spent on the item. I received the decanter promptly and in perfect condition. I did not have to use customer service. The order was placed online. This is a beautiful decanter that makes a wonderful gift. We are enjoying the very best wines to their fullest now. Fun to fill with aerating funnel. Stronger than it looks, holds easily in one hand and pours very well. After reading other reviews I purchased this decanter for a dinner party and for future use. Everyone was in awe of the unique shape and the ease of use. I am so glad we purchased this item. It was a conversation piece but also something quite practical. I think you'll sell more of these. Our Friedns just stare at it. We love this product and I am here again to buy one for our friends. I'm sure it's will not be the last one we buy because it makes a very special gift. This decanter is kept on the dining room buffet because of its good looks. Fabulous gift for wine drinkers. The only decanter which allows easy pouring of port into port sippers or other narrow glasses. Beautifully balanced in the hand. Finally bought one after all the raves from people we gifted them to. I bought this for my husband and he loves it! Not only is it very stylish, but it works wonderfully. The narrow spout makes it so easy to pour. This is a beautiful decanter and adds style and distinction to any event. We love it and will order a second one for sure! This is such a beautiful way to serve wine. It always tastes better when served from great decanters in nice wine glasses. We first saw this decanter on a cruise. It is a wonderful way to serve wines. My husband loves red wine and we used to open a bottle and let it breath. This decanter not only looks elegant, it makes wine taste better. It even looks beautiful empty and on the bar shelf. Very happy with our purchase. Made a wonderful wedding gift. Love to decant wines in all price ranges. This was purchased as a Christmas present for my husband, and it absolutely took his breath away when he opened it. It makes a spectacular statement on the table. We hosted a Past President's meeting for our Rotary this week, and everyone commented on the elegance of piece. No doubt that it is pricey, but so worth the investment. This has been ordered over for over 3 weeks and still is on BO. No way to evaluate when one has yet to see it.